LIFE.com has collated yet another excellent gallery dedicated to the celebration of the summer solstice in the UK. Druids: Mystery, Faith, Myth stars some nattily attired modern druids celebrating the solstice at Stonehenge, including one gentleman with a monocle whom I absolutely adore. If anyone can tell me who he is, I’d love to know. 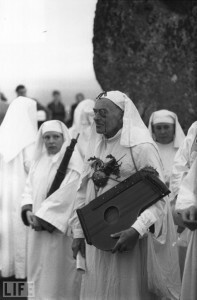 He must be a prominent figure in the Neo-Druid movement of the 1950s, because the LIFE gallery has another shot of him shaking hands with a second Druid on the Isle of Mull in Scotland in September of 1954 during what was considered the first gathering of Druids in Scotland since antiquity. The nation of all the Gauls is extremely devoted to superstitious rites; and on that account they who are troubled with unusually severe diseases, and they who are engaged in battles and dangers, either sacrifice men as victims, or vow that they will sacrifice them, and employ the Druids as the performers of those sacrifices; because they think that unless the life of a man be offered for the life of a man, the mind of the immortal gods can not be rendered propitious, and they have sacrifices of that kind ordained for national purposes. Others have figures of vast size, the limbs of which formed of osiers they fill with living men, which being set on fire, the men perish enveloped in the flames. They consider that the oblation of such as have been taken in theft, or in robbery, or any other offense, is more acceptable to the immortal gods; but when a supply of that class is wanting, they have recourse to the oblation of even the innocent. The Roman sources all indicate that the Druids performed human sacrifices. Again, we have little to no evidence of this, and even if it were true that the invading Romans saw Druidic ritual human sacrifice, they could have been performed in response to the destructive trauma of invasion rather than as a regular part of Druidic practice. Certainly the Druids today reject this characterization as an aspersion cast by ancient enemies. Modern Druid rituals and beliefs spring from a more recent tradition, the late 18th, early 19th century Romantic fascination with ancient Britain and its mystery religions. 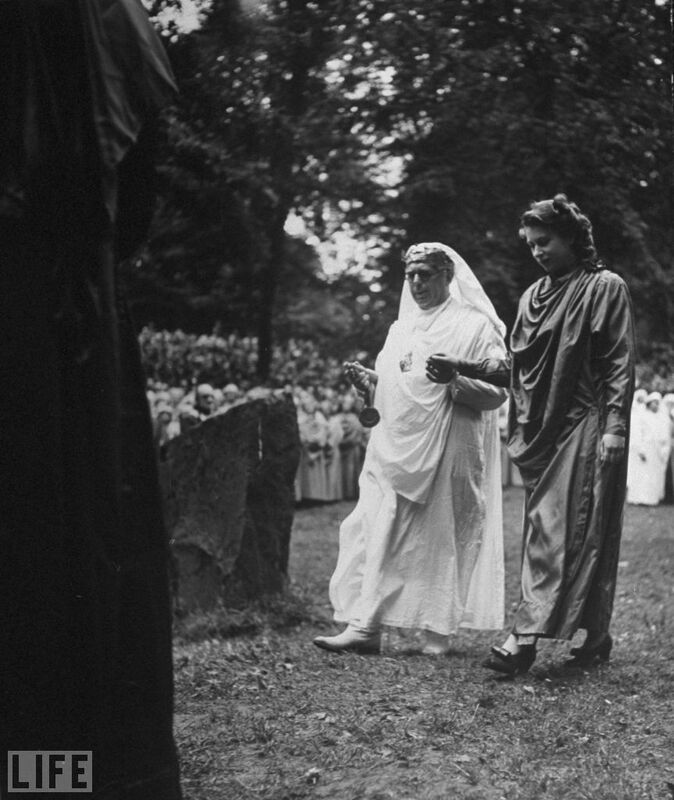 It is that tradition we see then-Princess Elizabeth celebrating in the LIFE picture from August 6, 1946 where she is being led into the Sacred Circle of Bards at the national Eisteddfod at Mountain Ash, Glamorgan, Wales. We owe the fantastic spectacle of the future Queen of England and Defender of the Faith donning the green robes of the novitiate and being invested a bard in a Druidic ceremony to one man: Edward Williams, a.k.a. 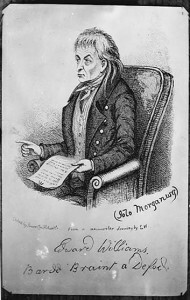 Iolo Morganwg, stonemason, poet, Welsh nationalist, manuscript collector and most able forger. Born in 1747 in Llancarfan in Glamorgan, southern Wales, Williams was a political radical, religious dissenter and pacifist Jacobin who believed Wales should have its own national institutions celebrating its unique culture and heritage. As a young man working as a stonemason in London, he had seen Welsh culture widely disparaged. He believed the Welsh poets were the direct descendants of the Celtic druids, and he set about writing so glorious a history it would put the English to shame, even if he had to forge it, by gum. In support of that vision, in 1789 he published a collection of poems by 14th-century Welsh bard Dafydd ap Gwilym. Included were many newly-discovered poems Morganwg had “found,” i.e., written himself. The book was popular and inspired him to return to London to take the next step in promoting Welsh culture. On the 21st of June, Summer Solstice, 1792, Iolo Morganwg held a ceremony on Primrose Hill in London founding the Gorsedd of Bards (in Welsh the Gorsedd Beirdd Ynys Prydain), a community of Welsh bards dedicated to preserving Welsh language, poetry and music. He developed the ritual for the ceremony from druidic rites described in ancient manuscripts from his collection that were later found to have been the product of his own very fertile, laudanum-addicted imagination. It wasn’t just the English disdain that he was combating with his founding of the Gorsedd. There was intra-Welsh snobbery too, courtesy of northern Wales (Gwynedd), which saw itself as the purest expression of the Welsh poetic tradition. Morganwg’s manuscripts were evidence that only in southern Wales, in his own region of Glamorgan, was druidic lore preserved intact from ancient times, through centuries of oppression from Rome, the Christian Church and England. He kind of pulled it off, too, especially by linking the Gorsedd with what would become the national festival of Wales, the Eisteddfod. The Eisteddfod is a folk festival celebrating Welsh language, music, poetry and literature that traces its lineage back to a grand gathering of musicians and poets held by Lord Rhys of Cardigan in 1176. From that early progenitor, a vast number of provincial gatherings proliferated over the centuries, sponsored by local lords all over Wales. In 1819 the eisteddfod festivals and the Gorsedd of Bards came together, thanks again to Iolo Morgannwg, now 72 years old and still with a keen eye towards promoting Welsh civilization. He traveled to the eisteddfod being held at the Ivy Bush Inn in Carmarthen and drew a Gorsedd circle — meant to be a sacred circle of standing stones a la Stonehenge — on the lawn using a handful of pebbles. In the circle, he invested the notables present as bards and druids, including the local bishop and festival patron, Bishop Thomas Burgess of St. David’s. 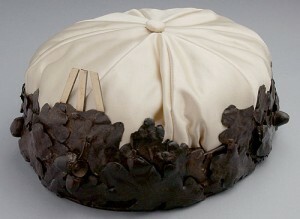 From then on, the Gorsedd and the eisteddfod continued to develop their relationship, and when the National Eisteddfod was established in 1861, the Gorsedd’s Druidic rituals, now considerably more elaborate than they had been at that first Primrose Hill ceremony of 1792, played a central role, providing high drama and pageantry in the medal ceremonies and in the investiture of important political, religious and cultural figures into the Gorsedd in recognition of their contributions to the nation, language and culture of Wales. It’s a remarkable feat of cultural transformation Iolo Morganwg accomplished, going from naked English contempt for the Welsh to the future Queen herself donning green robes and joining the Gorsedd Circle in a celebration of Welsh language, culture and civilization. You can see a little more of the Gorsedd’s ceremonial flair in this Pathé footage of Princess Elizabeth’s investiture, complete with sung hymns and Archdruid Crwys Williams drinking from the huge and curvy Horn of Plenty. For more on Welsh history in general and on the Eisteddfod and Gorsedd in particular, do yourself a favor and browse the excellent website of the National Museum of Wales. This entry was posted on Tuesday, June 21st, 2011 at 9:16 PM	and is filed under Modern(ish), Multimedia. You can follow any responses to this entry through the RSS 2.0 feed. You can skip to the end and leave a response. Pinging is currently not allowed. Thank you for this fascinating post, and to discover that Queen Elizabeth II waded into this. It is a fine example of how any religion morphs over time. In this case, it is more thoroughly documented and has occurred over a much shorter period of time. We all need to feel special and different in some way, don’t we? Most certainly, and for a member of an oppressed culture, that need is magnified a thousand fold. There’s a fine be-monocled line between cool and goofy. Tracing the fine line between “creative anachronism” and “inspired half-assedness”: I recall monocled Morris Dancers in 1970s Oxford. Great Post, re Caesar and the Druids, it is indeed probable that he misrepresented their affairs for political ends…..